Gerdt’s assessment, which defines Sandzén as the region’s master, is also an understatement. 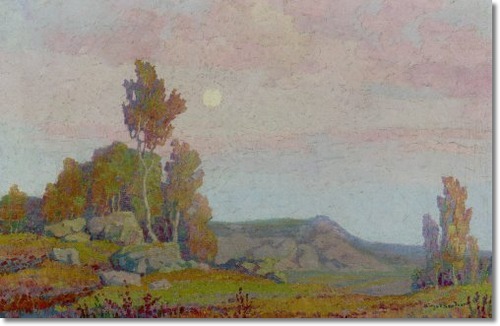 Sandzén’s ability in several techniques came to him by studying with accomplished artists from different schools (Olof Erlandsson, Anders Zorn, Per Hasselberg and Edmond Aman-Jean) who introduced him to pointillism and impressionism. 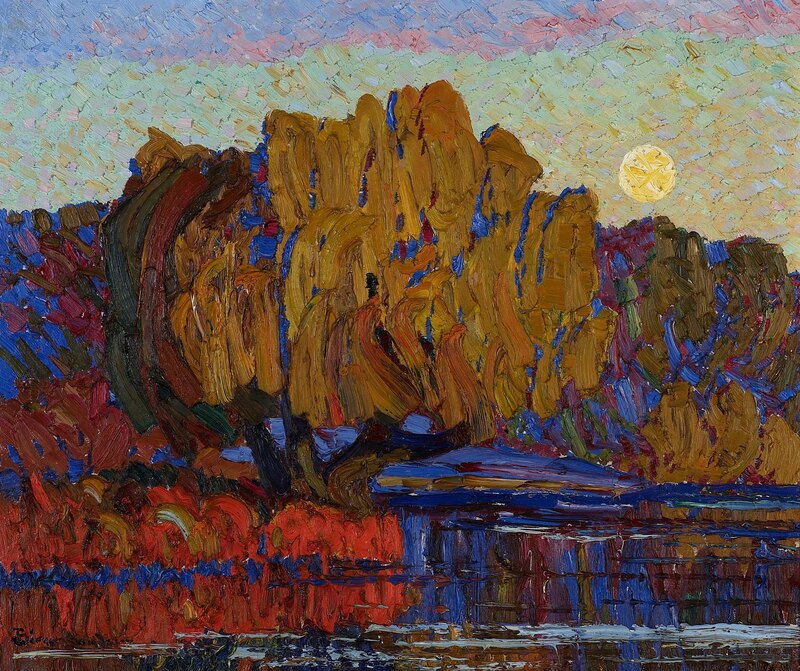 When he accepted a teaching position at Bethany College in Lindsborg, Kansas, the immediate area and the American Southwest became his muse, the landscape which inspired his life’s work and painting style, which then independently evolved (not by rubbing elbows and paint brushes with his contemporaries in Paris) to incorporate bold strokes and uses of color akin to post-impressionism, fauvism and expressionism. His work is rich with colors, thick with paint, and the scale and magnitude is enormous. Some of his canvasses measure 5 feet by 7 feet. One painting in his restored studio is easily 10 feet wide. He lovingly depicts scenes from the Rocky Mountains, Kansas prairies, and Swedish landscapes. Here’s the thing: I believe that Sandzén could become a recognized and renowned artist across the country and perhaps internationally if a small team of fundraising professionals were engaged to create and sustain a long-term strategic multi-media marketing and fundraising plan for the Memorial Gallery that bears his name. My introduction to and involvement with this amazing artist started in 2007 when I accepted an offer to manage a $3 million capital and renovation campaign for the Gallery… located at Bethany College. 1. It didn’t have a history of raising major gifts. 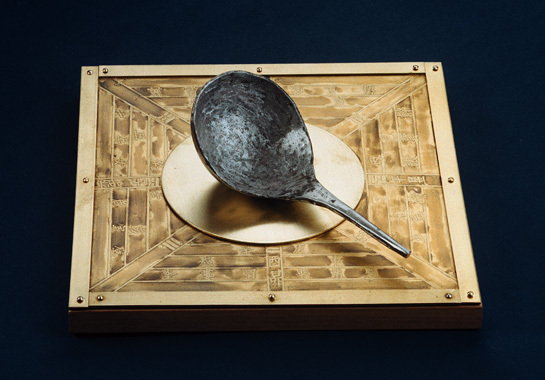 For decades the Gallery relied on Sandzén’s daughter Margaret for the vast majority of funding to meet operating costs. When the Gallery’s needs became truly drastic, Margaret, who passed away in 1994, sold some of her father’s paintings to make ends meet. 2. The Gallery had a relatively small donor base and most gifts were quite small and acquired through a membership program, which, unfortunately, was never fully developed. 3. The Gallery wasn’t well known outside of Central Kansas. And while the Gallery is beloved by many people in Lindsborg and the surrounding area, Sandzén’s national reputation is quite anemic for such a prolific and talented artist. One highlight of the first year of the campaign was that we were able to recruit Mark Parkinson, who was then the Kansas Lt. Governor, as a volunteer. He had a personal passion and interest in Sandzén and offered to help as the Honorary Campaign Chair. Despite the limitations on someone in political office helping with a fundraising campaign, he helped us with receptions, meetings, and calling on donors. Actually, it was quite a coup for such a small organization to have the open support of such a high profile public figure. However, we were never able to really take advantage of Mark’s support and help. In hindsight, it should have been obvious that with a small donor base, no history of major gifts, limited public awareness, and no strategic plan, the Campaign would most likely fail to “go viral” and generate the public relations momentum that accompanies and supports the patient and long-term fieldwork by fundraisers – to ultimately solicit major gifts. We just couldn’t get any traction or enough of the kind of success that builds on itself. Then the financial collapse of 2008 hit and most of the larger gifts the Gallery was counting on never materialized. That’s when I recommended, and the Campaign Committee approved, that we postpone the active solicitation phases for at least six months and instead, focus on building awareness and expanding the reach of the Gallery. I’ll always remember 2009 as the year I spent on the road. Because of Sandzén’s frequent visits to the Rocky Mountains and numerous mountain-motif paintings, his work is widely collected among the wealthiest arts patrons in the western United States. During the year, I made dozens of visits to Denver, Colorado Springs, Kansas City, Palm Springs, Los Angeles, and Minneapolis/St. Paul. I was able to meet and get to know dozens of enthusiastic Sandzén collectors, dealers, and museum curators. In a few circles, his work is revered. Every person I met was thrilled to learn about the Gallery and talk about Sandzén’s artwork. But the challenge was that while all of the people I met truly loved of Sandzén, the same could not be said for their interest in the Gallery. Some had heard of the Gallery, some had visited, but most had never given or been asked to give a contribution. So, while finding enthusiastic new prospects was quite easy, very few would consider anything more than a token gift for most major gifts typically grow out of a long-term relationship and the Gallery hadn’t developed this history of interaction with prospects. One of the cultivation strategies we employed was to organize receptions at the homes of Sandzén collectors and in private art galleries. It was during one of these receptions at the David Cook Gallery in Denver that I met a producer for Colorado Public Television (CPT12). He explained that he was interested in producing a documentary about Sandzén that would air on his station and be available to the entire PBS network. It was a perfect marketing device that could raise awareness much faster and more broadly than we could ever do by ourselves… and the Gallery could use it for years to come. I was immediately excited about the idea and we started planning how the Gallery could help with the fundraising and production. As things turned out, the Gallery missed this strategic opportunity and limited their assistance to allowing the producer and his team to conduct interviews and shoot footage of Sandzén paintings. At this time, I also had the opportunity to sign a separate agreement with Colorado Public Television to be the Associate Producer for the project. I helped with their production and fundraising – and was careful to refrain from approaching any current Gallery donors and focused my efforts on prospects that had either declined to give to the Gallery or would only give to projects in Colorado. Then on Christmas day, 2010, Sandzén: Ecstasy of Color aired on Colorado Public Television and brought Sandzén and his work to a whole new audience and continues to shine a light on the Gallery every time it’s aired. I spent the final year of the Gallery’s campaign following up with major gift level prospects, submitting grant proposals, and wrapping up as much of the work as possible. The final tally for the campaign: $1,490,000, just 49 percent of our goal. Ironically, Sandzén’s off-the-mainstream geographic base (the inspiration for his work) has also contributed to the fundraising challenges that the Gallery faces from its home in Lindsborg. My experience with the Sandzén fundraising campaign reinforced my conviction that there are very important elements that small nonprofits must pay attention to in order to conduct a successful capital campaign. But first and foremost, you have to be willing to take advantage of opportunities as they present themselves. The documentary – Sandzén: Ecstasy of Color – provided one rare opportunity (in our all-encompassing multi-media world) on which to collaborate, leverage and potentially build a major gifts campaign. Yes, there are risks as you can lose control of your message. Unexpected momentum can be new and unsettling (and yet also thrilling), to say the least. The comparatively quiet alternative is that you’ll never figure out how to significantly advance your mission or your strategic plan. And isn’t that what we’re supposed to be doing? An excellent fundraising case study. Thank you for the study and the uncommonly candid wrap-up conceding that while there was success against strong odds the target amount remained unachieved.